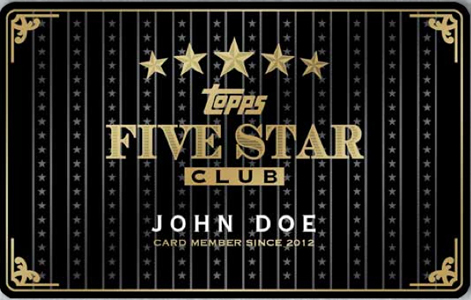 The Topps Five Star Club is a program intended for a small group of collectors. It promises exclusive cards, special access to Topps staff and more. New and exclusive autographs on a quarterly basis. Exclusive Topps Five Star Baseball and Five Star Football parallels. Quarterly phone calls with Topps staff. VIP access to Topps events at the National. Joining is free -- sort of. You need to buy a lot of Topps products to qualify. Along with a completed application form, collectors must submit an essay, a letter of reference from a local hobby shop or online dealer and evidence of having spent $10,000 on Topps cards in the last year. The essay is expected to be 500 words or less and explain why the applicant wants to be a member.Receipts are helpful as evidence of purchases, but collectors can also include pictures of their collection or have it mentioned in their reference letter. Membership in the Topps Five Star Club is good for one year. The deadline to apply for the 2013 calendar year is November 30. New applicants will be accepted late next year. There are a couple of caveats for those accepted to the program. First, it is only open to collectors in the United States. Members are expected to participate in most of the scheduled calls. Finally, members are expected to be ambassadors of sorts for the company. Any critical comments should be reserved for private discussions and not posted online and through social media channels. Full details on the Topps Five Star Club and application forms can be downloaded here. How about Topps Five Star for Dealers, not for collectors. 10,000 dollars worth, that is a lot. Must have spent $10,000 to join? So, membership dues are $10,000, not really free. If you buy less, then Topps doesn’t really give 2 cents about you then. What a joke. 2012 TOPPS FIVE STAR QUOTABLE YU DARVISH RC AUTO "LET'S GO RANGERS!!" 05 10! !